Your second chance to a beautiful smile. It starts with Dr. Eye placing the titanium post within the jawbone. Once the post is fused with the jawbone, the abutment and crown are beautifully fitted on the post, creating a natural-looking restoration. How Exceptional Smiles Make Implants... Exceptional! Smile faster. Spend less time in the chair. At Exceptional Smiles, we use minimally-invasive dental implants, making your treatment as pain-free as possible. Missing teeth and unstable dentures make it extremely difficult to eat and speak with confidence. You may be slurring your words or can't enjoy that delicious apple without being in pain. A dental implant is firmly placed and functions like a natural tooth, making it easier to eat and speak. As long as you keep up an excellent oral hygiene routine, your implant can last up to a lifetime. Also, it's the best option for your smile since it doesn't require our dentists to reduce the size of your surrounding teeth, keeping them healthy and functional. Undergoing extensive continuing education, Dr. Eye can place AND restore your implant in the same office. This eliminates the need to refer you to a specialist, seeing the same face from start to finish. Our experienced Implant Dentist uses the Cone Beam technology to accurately visualize and plan the placement of your implant, creating predictable results. With our soft touch and modern technologies, you won't need to undergo full surgery to receive your artificial tooth. Minimally-invasive dental implants require less time and little to no postoperative pain. Because we want all of our patients to get the smile of their dreams, we're offering a fantastic price for your first dental implant. Your first implant is only $890 ($2200 value) for a limited time. Don't miss out! From replacing a single missing tooth to replacing a whole smile with All-on-4 dental implants (the full denture alternative), our patients have lots to say about their dental implant experience. What's the difference between minimally-invasive implants and traditional dental implants? Unlike traditional implant procedures, minimally-invasive implant procedures require fewer appointments, less healing time, and little to no pain. With minimally-invasive techniques, you can have a single implant placed in as little as seven minutes with a general healing time of just three months. Dental implants can be used to replace a single missing tooth and multiple missing teeth. If you're missing one tooth or multiple teeth, a single implant placement would be the best option.Dental Implants can also be used to stabilize slipping and sliding dentures. Titanium posts will be placed within your jawbone, and then your dentures will be securely placed on the posts. This ensures a stable fit. Stop jawbone deterioration: When you have missing teeth, the jaw loses its support. This results in the jaw to deteriorate, losing facial support. With a dental implant, the post acts as the tooth root, stopping the deterioration process and stabilizing your jaw. Healthy teeth: Unlike a dental bridge, Dr. Eye doesn't need to shave down your surrounding teeth to make room for the dental implant. This keeps your natural teeth's function and beauty, keeping it healthy for the future. Improved appearance: Implants mimic the function AND look of natural teeth. This means your implant will blend seamlessly with your smile - no one has to know you have an implant! Since implants look and feel like natural teeth and can last up to a lifetime, dental implants are well worth the investment.Every situation is unique, which is why we'll work with you to accommodate your financial needs. We're also offering a unique promotion for our minimally-invasive dental implants. Get a free consultation ($185 value), and your first implant is only $890 ($2200 value). 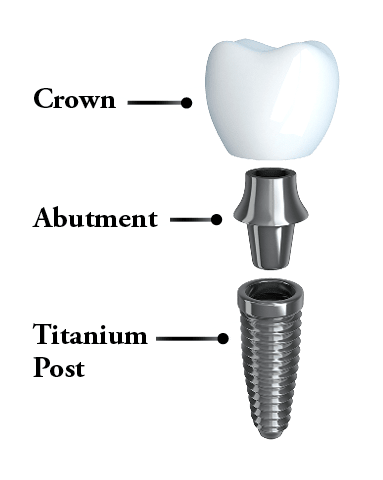 What is an All-on-4 implant? The All-on-4 dental implant method is a full-arch smile permanently fixed in the jaw like natural teeth. Using four strategically placed implant posts, Dr. Eye II will securely place a full prosthesis similar to a denture but one that will not move around in your mouth while you eat, smile, and laugh. Still have questions about dental implants in Harrisonburg, VA and Woodstock, VA? Our exceptional dentists are here to help. Give us a call!